Plant of the month. September 2014: WHIRLING BUTTERFLIES – Glacier View Landscape and Design, Inc. The nights are getting shorter, cooler, and dew is forming on the grass in the mornings. The smell of fall is in the air. 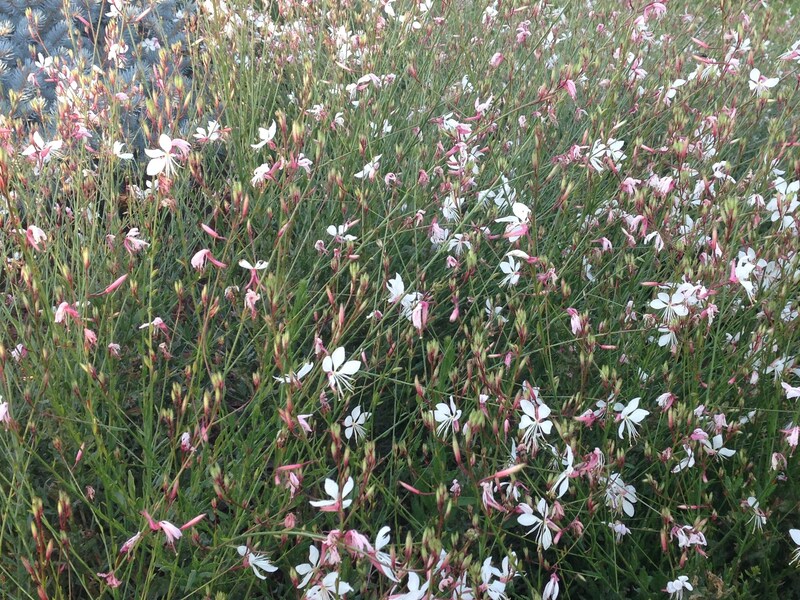 But the last grasp of summer heat still lingers and this helps push the Whirling Butterflies (Gaura lindheimeri) into full bloom. Whirling in pink and white, these one inch diameter flowers dance and twist in the wind and hence the name, look like dancing or whirling butterflies. A North American wildflower, these plants have dark green slender foliage on long wiry stems with airy open flowers. Plants gain 24-48 inches in height and width and look great planted en masse. They will sometimes seed over winter, but are reliable for returning from their original root stock. Moderate moisture is needed to establish, but are drought tolerant once in place. Simply cut them back to the ground in late winter and be prepared to wait…..they are not an early season bloomer and sometimes seem to just sit and do nothing….at least for this impatient gardener. They do take up quite a bit of space once in bloom so do follow planting instructions of 2-3’ spacing….they like the extra room to flop once blooming. Whirling Butterflies are a great addition to gardens on the Front Range of Colorado, and Glacier View uses them often in landscapes where larger perennials are required. They do best in full sun but can handle part shade too. Drip irrigate here in Colorado as they get so large that they can block top down spray heads from reaching all but the closest plants. Enjoy them as cut flowers, or let them go through to late fall. They will take several freezes before going dormant for winter. Available as both pink or white, they will accent any perennial bed with great late summer and fall color here in Colorado. This is a great plant for hot and dry climates like we have on the Front Range of Colorado. Plan on mixing some into your perennial garden next spring!